Preserving documents and books is mission critical for historical society and archival collections. Join Minnesota Historical Society staff for a workshop that will teach the basics of handling documents, books, and paper artifacts in a collection. Participants will learn proper handling techniques, receive hands-on instruction on creating archival-quality book enclosures, and receive information on creating projects eligible for grants. 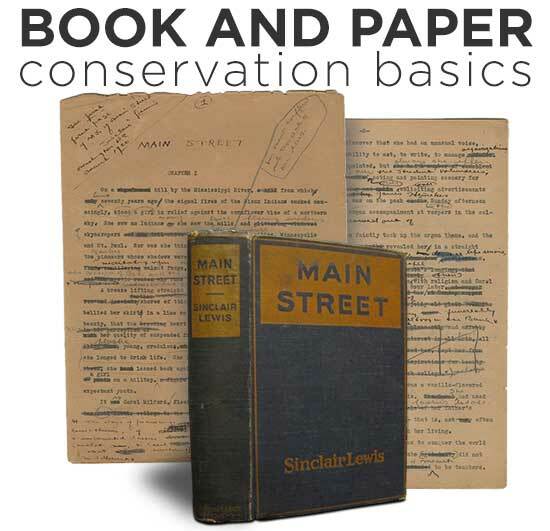 Learn how best to preserve your book, paper, and photographic collections, including practice handling a variety of materials to increase knowledge and develop an understanding of the links between common types of damage and improper handling techniques. There will be opportunities to ask questions regarding challenges in your own collections. In the second half of this workshop, participants will create two types of archival book enclosures: a phasebox and phase wrapper. Proper enclosures such as these provide books with physical protection and stability, as well as provide a buffer from environmental factors. These enclosures are a simple and relatively inexpensive way to take the first steps toward preserving books. Participants are encouraged to bring along two books (of reasonable size) to make the enclosures for. All materials and tools will be provided. Fee: $25 per person. Includes materials, lunch, and refreshments. Questions? Call Todd Mahon at 651-259-3492 or e-mail todd.mahon@mnhs.org.